Updated: Giveaway begins March 24th at 12am and ends March 31st at 11:59pm. Enter Below. Disclaimer: I received a complementary package of Hemp Hearts from Manitoba Harvest in exchange for an honest review. As always, all opinions are my own. The first official day of Spring was last Friday and I celebrated by sleeping for most of the day. I had grand plans to ring in the new season with some kind of outdoor activity, but – shocker – it was still pretty cold. 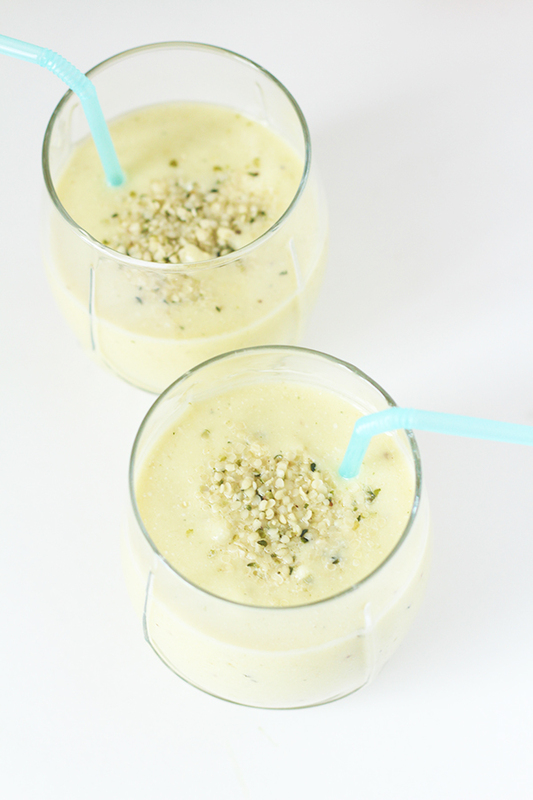 Thankfully, this weekend was a bit warmer, so I celebrated with this Pina Colada Hemp Smoothie. I used to be a huge fan of smoothies for breakfast. I even developed a smoothie making routine: bananas, spinach, frozen fruit, milk, protein powder. Blend. Pour. Devour. Despite my raging sweet tooth, I wasn’t a huge fan of how sweet my protein powder made my smoothies taste. So, over time, I got rid of the protein powder step, and started adding things like chia and flax seeda for a little protein boost. These days I have smoothies a lot less. I blame that on a combination of the cold and my recent caffeine addiction. As much as I love smoothies, I like being warm more, smoothies took a backseat to warmer breakfasts for the last few months. 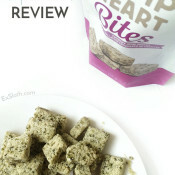 But, when I was given the opportunity to review Manitoba Harvest’s Hemp Harts, I knew I wanted to use it in a smoothie. Luckily, that coincided with ‘warmer’ weather, so I wasn’t left shivering for days. If you didn’t know, Hemp Hearts is Manitoba Harvest’s brand of hemp seeds. I don’t have a lot of experience with using hemp seeds so I poked around the web to see what I could find out. Hemp seeds come from the hemp plant and contain all of the essential amino acids. So, they’re an ideal source of protein for vegans, vegetarians and – you guessed it – people who don’t like protein powder in their smoothies but still want a protein boost. According to Manitoba Harvest, each 30g serving of Hemp Hearts contain 10g of protein and 10g of omegas. And when compared to the same serving of chia and flax seeds, Hemp Hearts has more protein and omegas and less carbs. Not bad right? This smooth and creamy pina colada hemp smoothie doesn’t have alcohol like it’s namesake, but other than that, the taste is pretty much spot on. Plus, it’s got avocados and hemp seeds for some added healthy fats and protein. Basically, if you’re in the market for a healthy mocktail, I’ve got ya covered. Plus, I’m Manitoba Harvest was nice enough to offer a bag of Hemp Hearts to one lucky reader, so be sure to enter the contest at the bottom of this post! 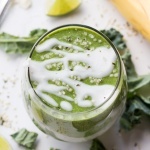 This pina colada hemp smoothie is a variation of the traditional cocktail sans alcohol, with avocados and Manitoba Harvest Hemp Hearts added in for some added healthy fats and protein. Are you a fan of hemp seeds? Have you used Hemp Hearts before? What are your favourite recipes to use hemp seeds in? Follow GiselleR | Diary of an ExSloth’s board :: Breakfast Recipes :: on Pinterest. 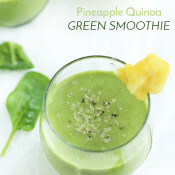 Oh this not only sounds amazing but I love how it is packed full of so many nutrients! Sounds amazing!! Thanks for sharing. Would you believe that I haven’t always been a pins colada fan? So glad I got over that phase haha. Thanks for hosting! 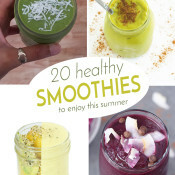 I’ve never tried hemp seeds, but that smoothie looks yummy! That graphic thoughhhhh!! Love. I love hemp seeds and I’ve been trying to remember to throw them into my smoothies more frequently. I love piña coladas! Great use of the hemp seeds! How yummy! I’m obsessed with hemp hearts – can’t get enough. Will have to try this ASAP!! Thanks for sharing! Love hemp hearts, I mix them with chia and a bit of hot water in the morning to make warm breakfast. 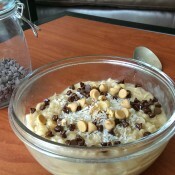 I love hemp seeds in my overnight oats, but really they are good on anything! Pasta, salads, casseroles — you name it! This smoothie is as far as I’ve gotten in my hemp seed journey so thanks for the ideas Melissa! YUM! your pictures look AWESOME by the way! Awesome! This was my first time as well and I loved it. Let me know what you think of them! And thanks for hosting Jill! Giselle, this looks like dessert and it’s so healthy . Yahooo! Love the little twist with the avo….nice way to add creamy richness. GOOD ONE! So excited to try this, and I bet my kids will love it too! Take care, lady! Mmm this looks so summery! Now if only the warm weather would arrive in Ontario! 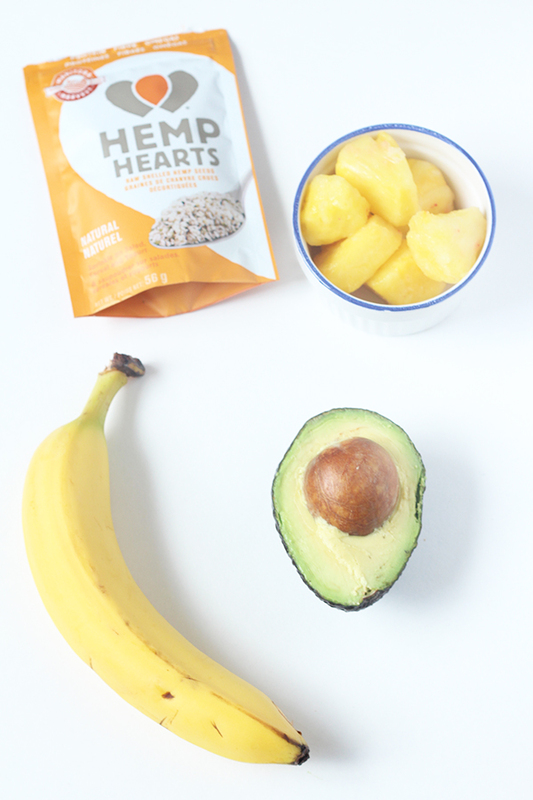 I love hemp hearts – I always throw them into homemade energy bars/balls! Chelsea @ Chelsea’s Healthy Kitchen recently posted…Have food blogs lost their passion? I am also not a fan of sweet protein powder, I’m on the lookout for a new one. But the idea of using hemp, chia & flax is a great idea for a replacer. 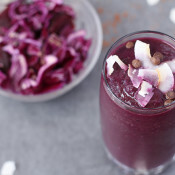 Love the sound of this smoothie! 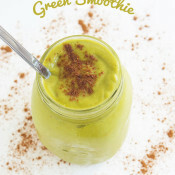 Thank you for sharing this great smoothie recipe. 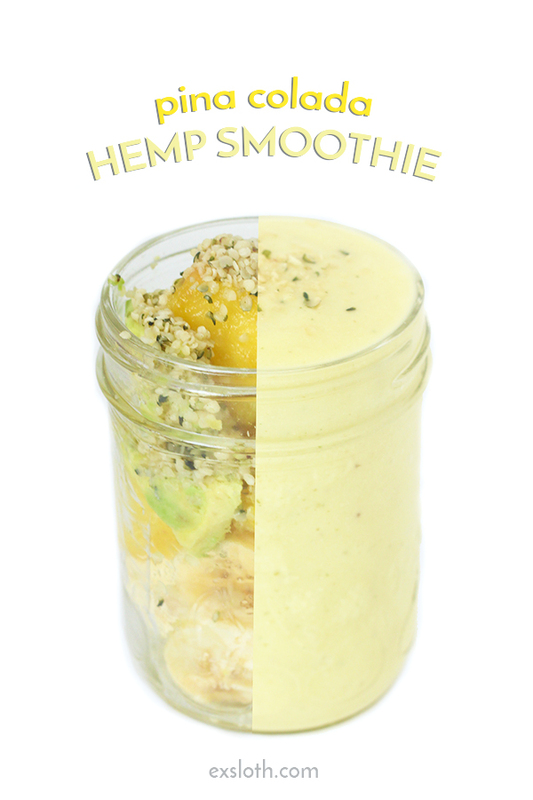 I hope you don’t mind that we share it on our Pinterest Hemp Smoothie Board. Your photos looks great, I know it took a lot of hard work. i love your post! amazing flavour combination ? I’ve made this smoothie time and time again and love it! Do you mind if I link back to your page with the recipe?! Hope you’re having a great day!